For those who want more than just pizza, Blaze Pizza offers up the "Take Two" special as a convenient alternative where you can get a half pizza and either a salad or four Dough Knots for about the same price as a whole pizza (may vary; it cost $8.65 in my area). Salad choices include Arugula & Fresh Fruit, Caesars, and new, seasonal Apple Salad. Available for the fall, the Apple Salad features apple, feta, cranberries, pepitas, and citrus vinaigrette over leafy greens. 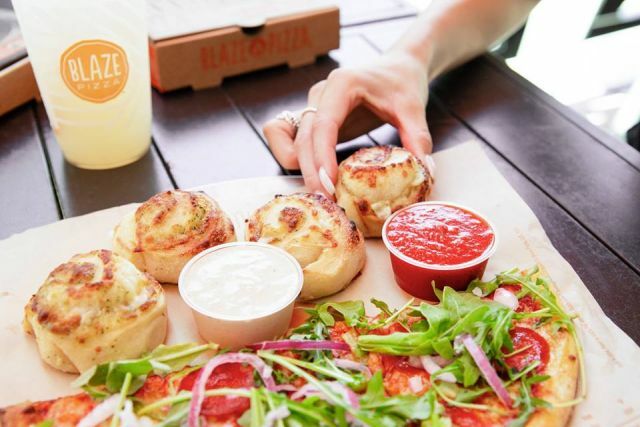 Along with the new salad, the pizza chain adds roasted corn as a seasonal topping and rotates in two seasonal drinks for the fall: the Kiwi Cooler and Sunset Punch. Blaze also recently added a new, signature topping combination that they're calling the "Hot Link." The spicy option consists of spicy red sauce, jalapenos, sausage, black olives, red onions, banana peppers, and mozzarella.